A true collectible quilt top. Sampler blocks held together with random string piecing. A combination of hand and machine stitching. 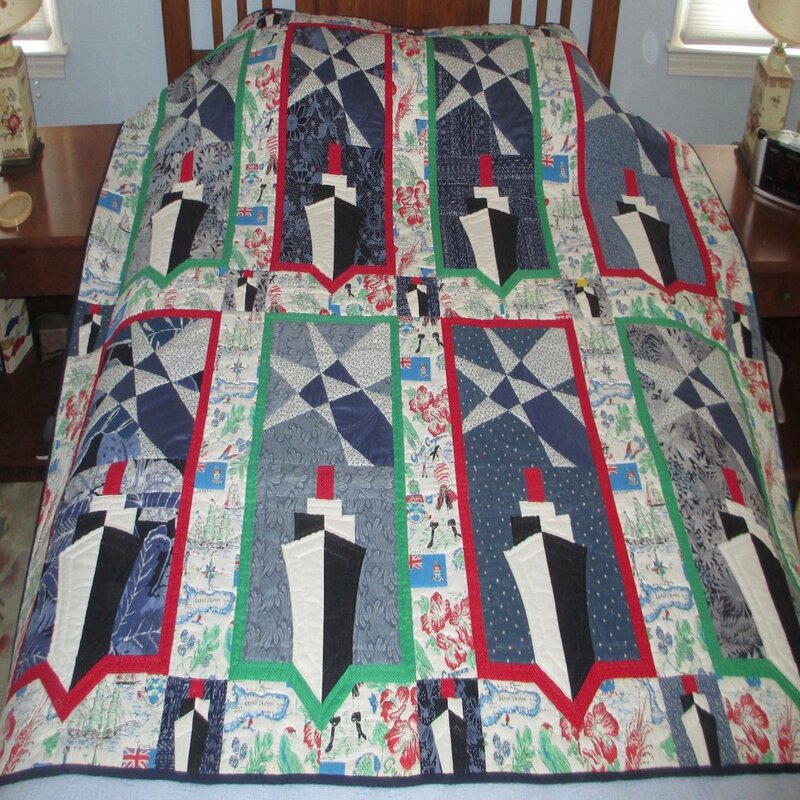 Gray and off white cotton fabric are repeated for this classic quilt. It has a wonderful feel with a few age spots that do not hamper its beauty. Hour glass piecework in 6 1/2” blocks with 3” sashing are hand quilted for this lovely quilt. A darker border accents all the blocks. Hearts set in an Irish Chain with red and green. It makes a great holiday feature in decorating. Some age spots. Machine quilted before “its time”. 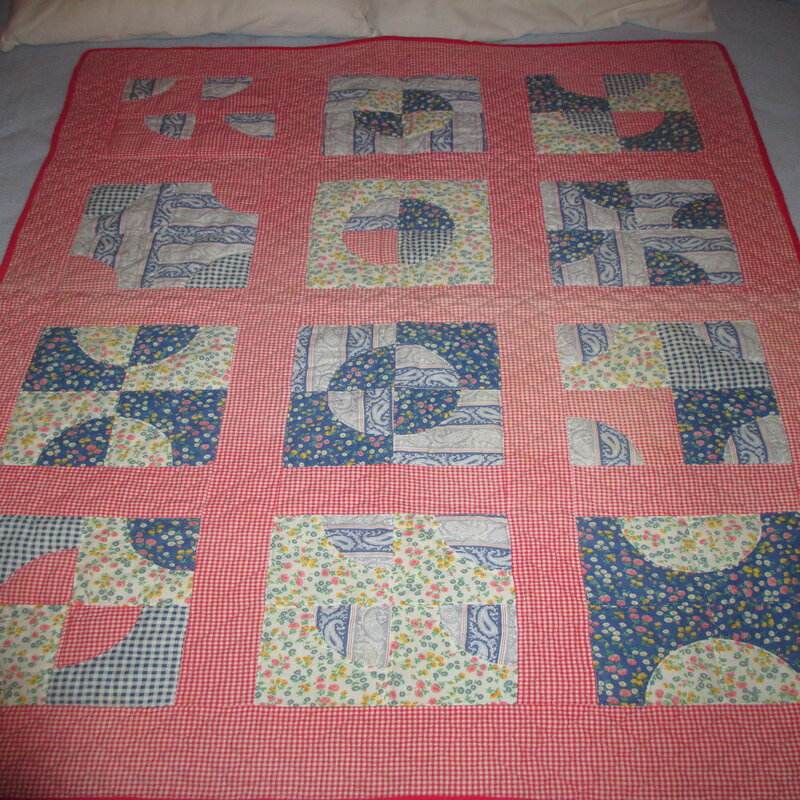 A pristine antique hand pieced 8 1/2” blocks with some machine 3” red sashing. The red and white borders were added for extra size. Ready to be quilted. Made in 1975 as an early trail and error sampler. The traditional blocks are 10” . A great beginner quilt. Here, I explored every which way for the Drunkard’s Path block in blue and red checkered cotton fabric. Featured on page 8 of Lap Quilting book. Made in 1981. The dark versus light mitered blocks create crosses in a subtle manner. The classic VIP floral print frame blue cotton fabrics for the sampler blocks. Page 0 of Lap Quilting book. Featured on page 112 of Lap Quilting book. 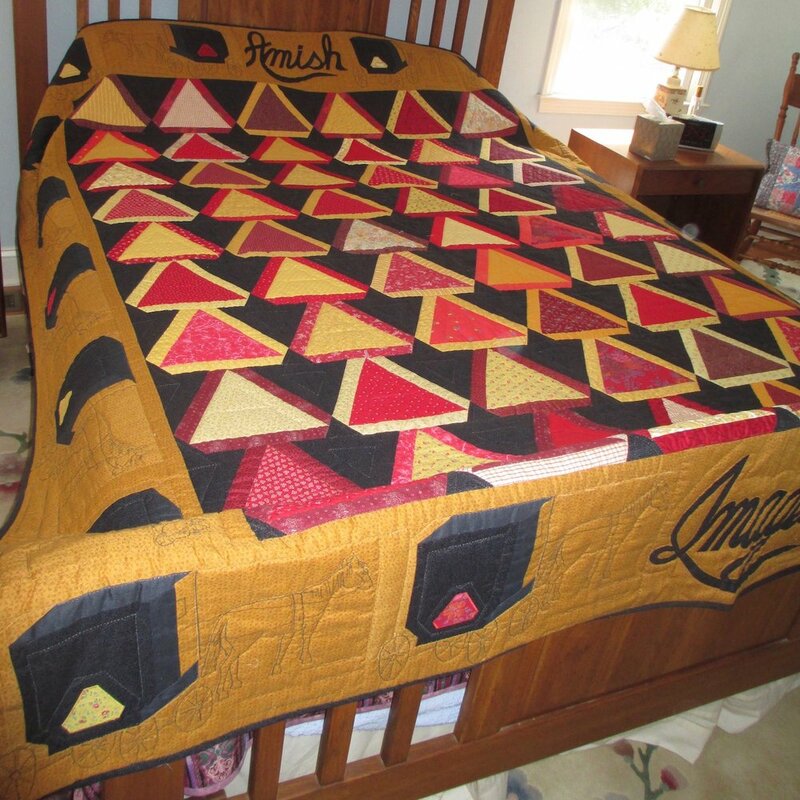 This quilt is hand quilted using brown thread and two layers of batting. Very warm and cozy. Red and green cotton fabrics and muslin sashing extend outward to scalloped borders. Made in 1979. Page 60 of Lap Quilting book. Made in 1980 as an early experiment of offset sampler blocks. Some fading due to black fabrics. An early entry into the Appalachian State College exhibit in 1975 winning a ribbon. Sampler blocks were new to the quilt world then. A vertical featuring the changing seasons to be adapted into a pull shade. The cotton tape is stitched on the back. Made in 1980. Four blocks named Another Star, form the central area for this wall hanging framed in a patchwork bright paisley border. Pages 21 and 37 i More Lap Quilting book. Page 52 and 53 of More Lap Quilting picture this quilt along with directions. 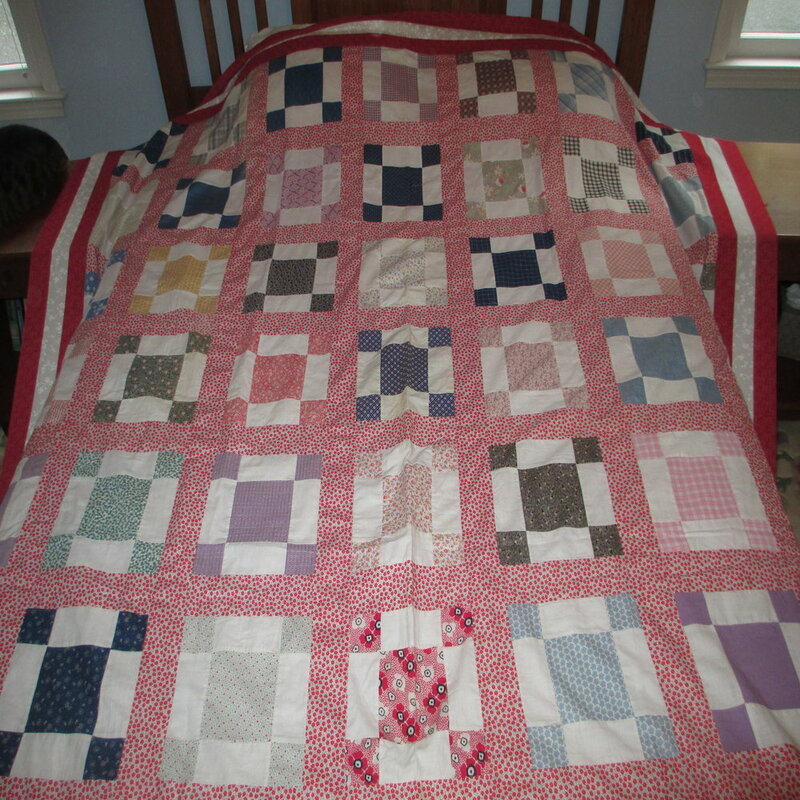 I made this quilt a second time as a wedding present for son, Jon and his wife. The circular area explores the flexicurve method. Sampler blocks along with antique squares are set on point in four staggered rows. Toile accents are on the border and the pieced backing. Hand quilted and seen on page 24 of More Lap Quilting. Eight rows of diagonal calico bricks are set between pink wide sashing. 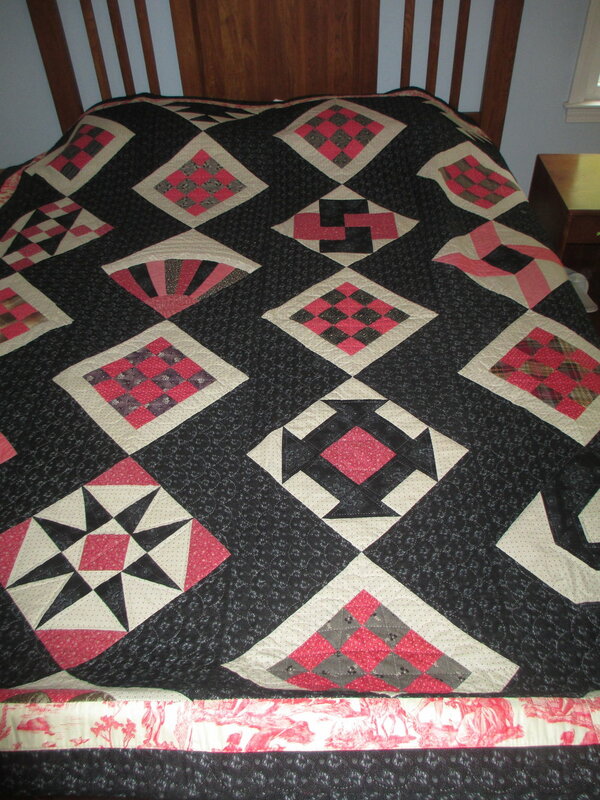 This is an antique quilt, circa about 1940-1950 in good condition. Hand quilted with a 12” block adapted from the full quilt. Page 93 from More Lap Quilting. Geometric shapes based on a 3” square form 9” vertical bands. Made in 1984 and one of the first quilts I made with dropped feed dogs enabling me to machine write sayings on each panel. Page 3 of More Lap Quilting book. The NC Lily pattern becomes String Along Lily with each diamond flower string pieced in shades of red. It is lap quilted in diagonal rows page 63 of the book, More Lap Quilting. 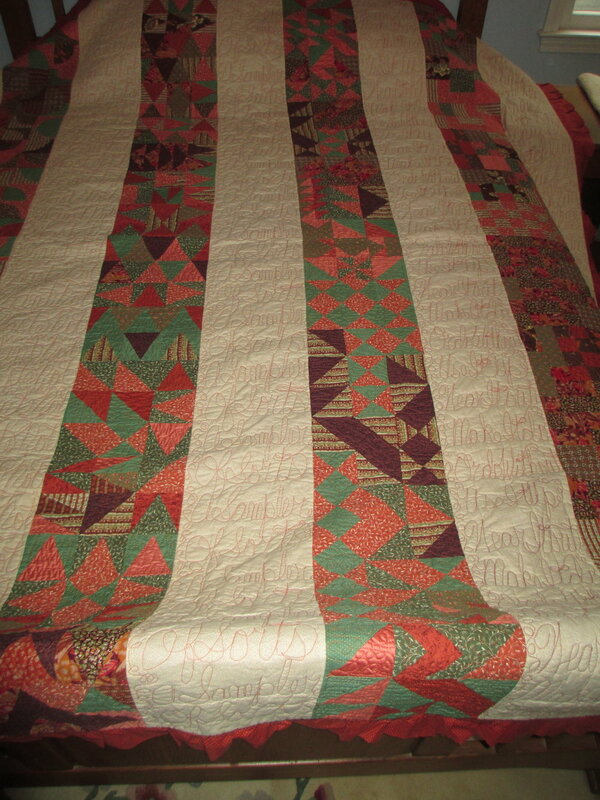 Various bands of patchwork radiate from a central LeMoyne star block-all in just muslin. Hand quilted in navy thread with a navy backing all in cotton fabric. New Ideas book. 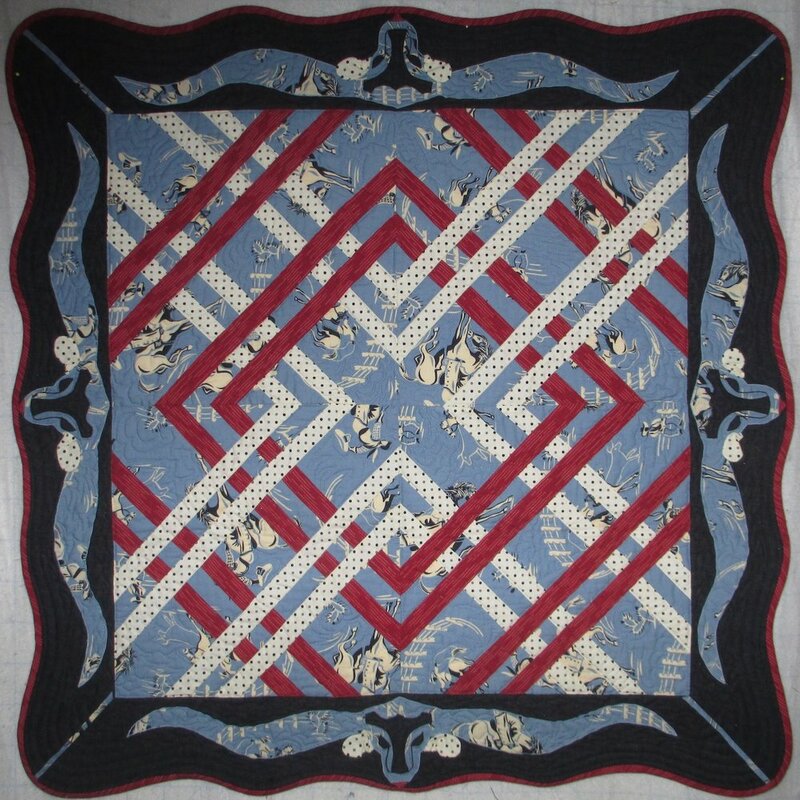 Four enlarged original cotton boll blocks designs with boll weevils in the corners. There is an exploding cotton swag border. The sham is a pillow cover up. Strip picture piecing or interrupted rectangles make a cat playing a fiddle with musical notes stitched in the background and a chevron type border. 72-74 of New Ideas for Lap Quilting give the details. With the original gray blackboard in mind the alphabet blocks are machine stitched in place. 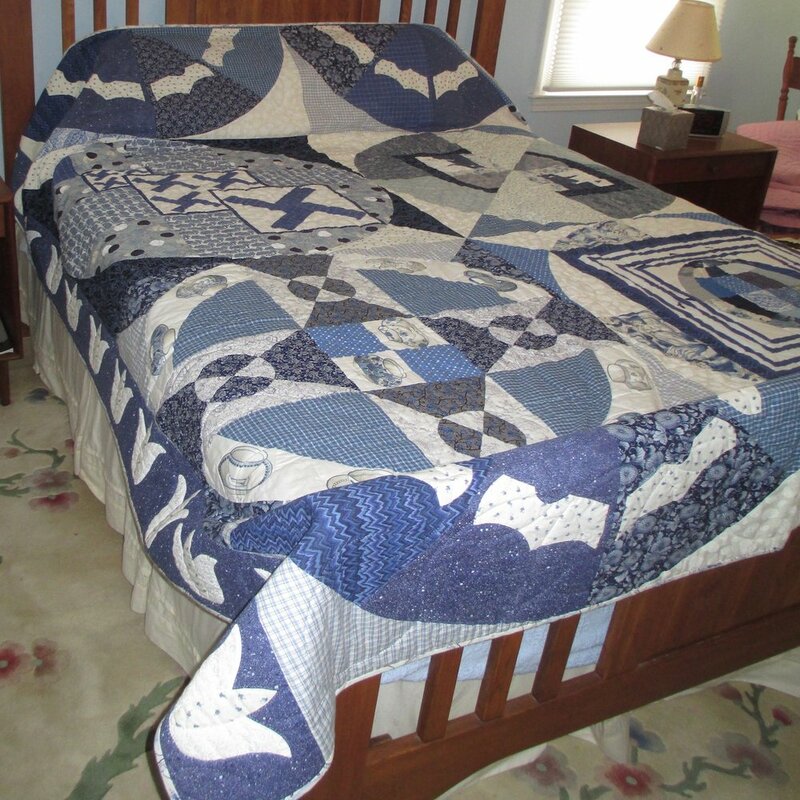 Hand quilted by Bonesteel with help in piecework by Barbara Swinea, Shirley Klennon, Mary Boyce and Alice Wortman. The Bargello method takes on a more modern style with machine quilting in the background. Many shapes of the spool design are represented in shades of rust, brown and beige. A border print and touch of blue make up the border. Page 55 of New Ideas book. An updated traditional pattern using curves across the entire surface through sky, sun and mountains. Featured on pages 118 @ 119 of Bright Ideas book. A quilted banner taught on one of my many quilt cruises. The nautical alphabet spells the ship: Caribe. Pages 52 @ 53 of Bright Ideas book. This wall hanging features the folded snowflake concept of a lap quilter. The 6” square border is an original block called Going My Way. This quilt is shown on pages 110 and 111 of Bright Ideas book. The Monkey Wrench pattern evolves into the Virginia Reel design using large floral print and glazed purple fabric. Pages 34 @ 35, Bright Ideas. Tall condos accent each end of this herringbone design for a machine pieced and quilted wall hanging. Pages 10 and 11 of Bright Ideas book. This small wall hanging echos the reflection of our NC mountains through sunglasses. It is featured on the opening credit page of Bright Ideas book. 66-69 of Bright Ideas book. A one of a kind Cruise ship quilt. The border cotton fabric actually bought on Grand Cayman. Seen on pages 56 @ 57 of Bright Ideas book. 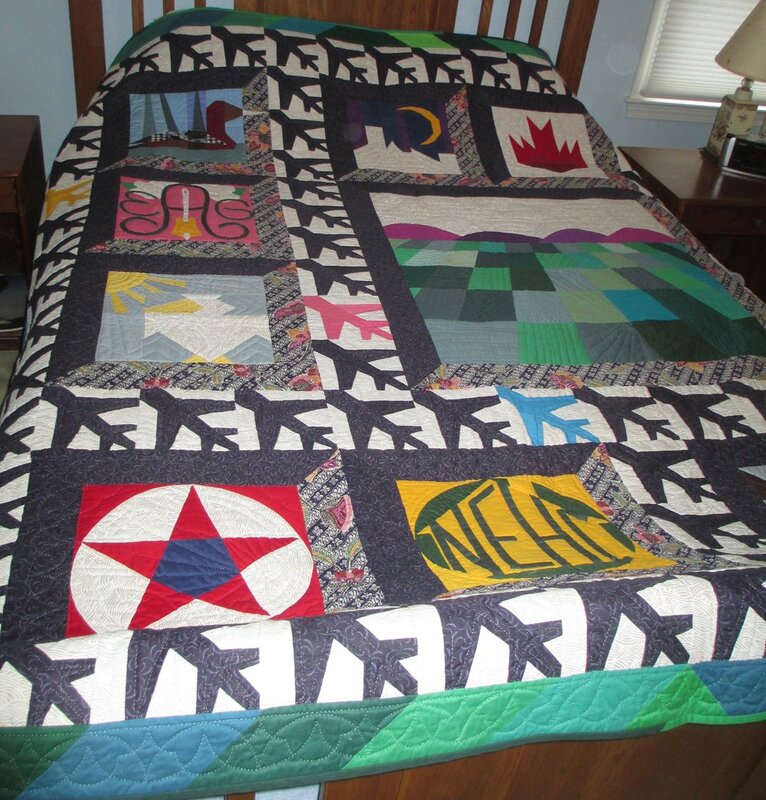 Vertical bands to represent totem poles decorate this quilt dedicated to my Alaskan travels. Clever masks along with caribou at the watering hole are featured at either end. Pages 46-50 of Bright Ideas. The original larger replica of this quilt hangs in our First Citizens Bank in Hendersonville, NC. Small star blocks surround one large medallion block that are machine pieced and hand quilted. Pages 92-93 of Bright Ideas book. Page 136 of Easy Does It Quilts features this original design of chattering people. Yackety Yack is machine written on the border. Some light fading with the darker fabric. Elongated red, navy and white strips form hexagons with woven plaid checks linking the rows together. Novelty hen fabric becomes the border. Pages 64-69 of Easy Does It Quilts book. Inspired by an iron fence men’s neckties become the rising sun in various blocks. Hand quilted with more tie ends accenting the border. Displayed at the Appalachian Regional Commission in Washington DC from June 8 until June,2020. Shown on page 158 in Georgia’s Gallery for the Easy Does It Quilts book. Many motifs from Holland pay homage to a wonderful visit to that country. Four shelves of the stacking dolls adorn this large cupboard. 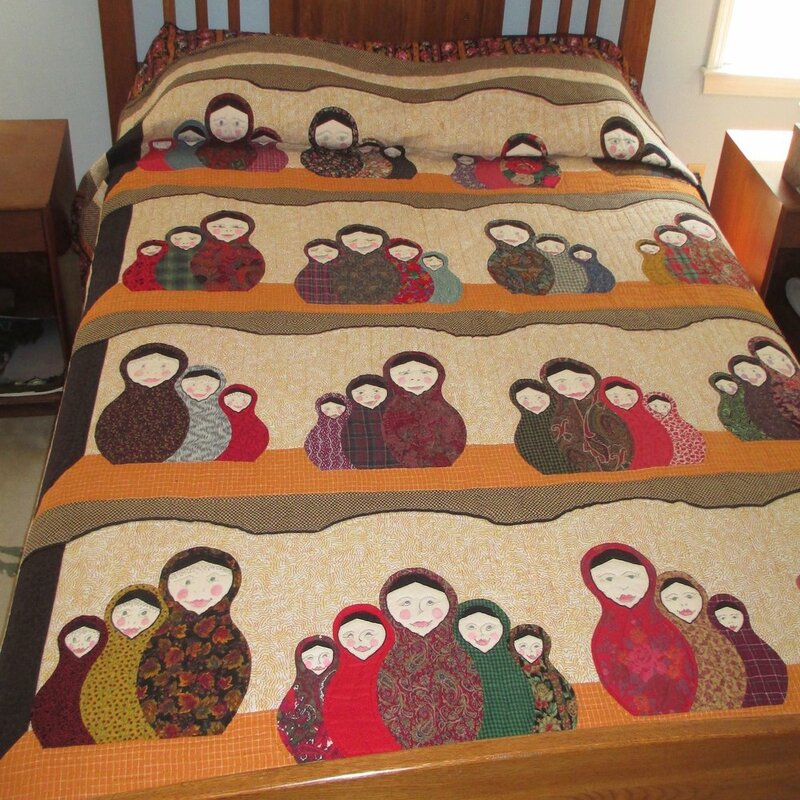 A fun quilt to make with many memories of stacking dolls with my Grandmother. 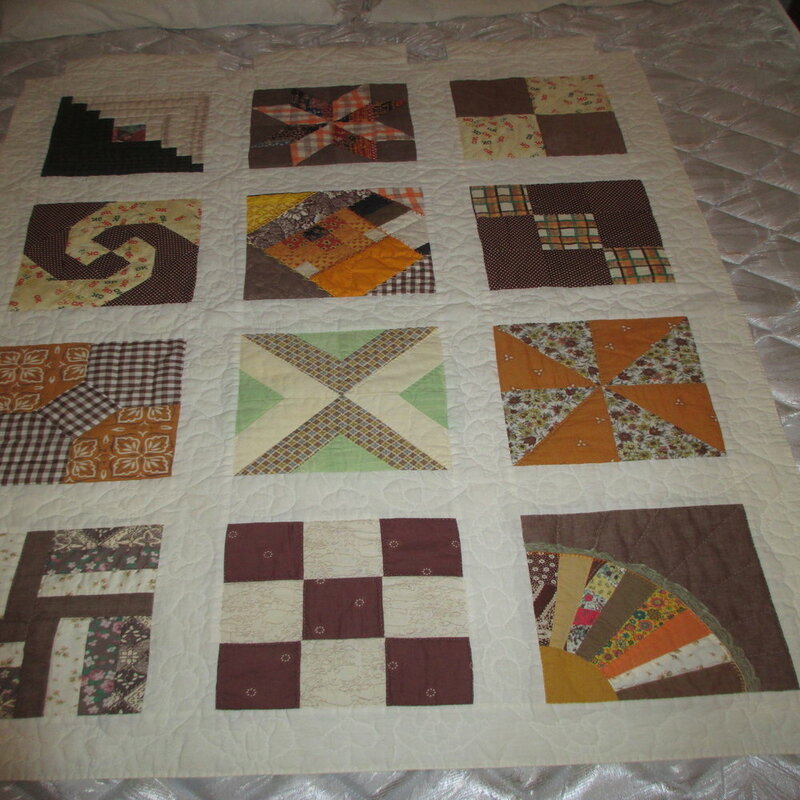 A smaller version of the Calico Crossover quilt that is featured on the cover of Easy Does It Quilts book, pages 42-45. 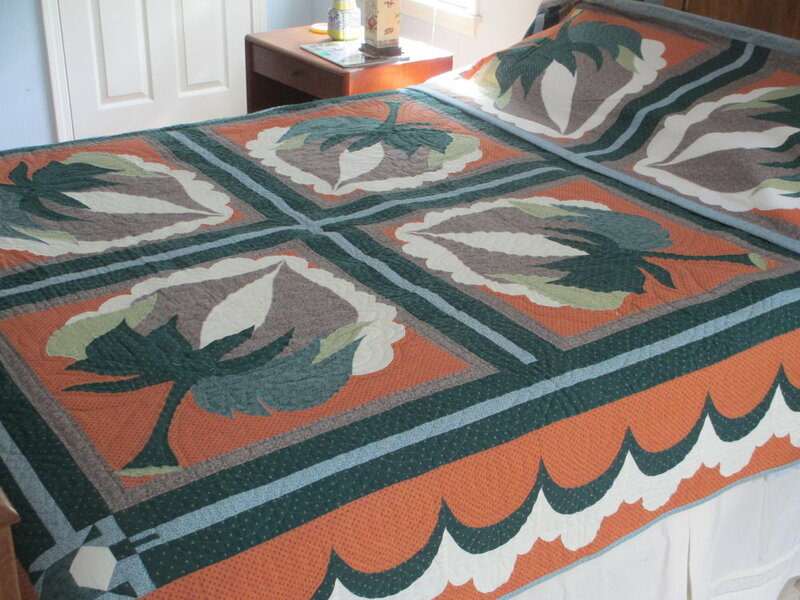 This quilt has a southwestern color adaptation. 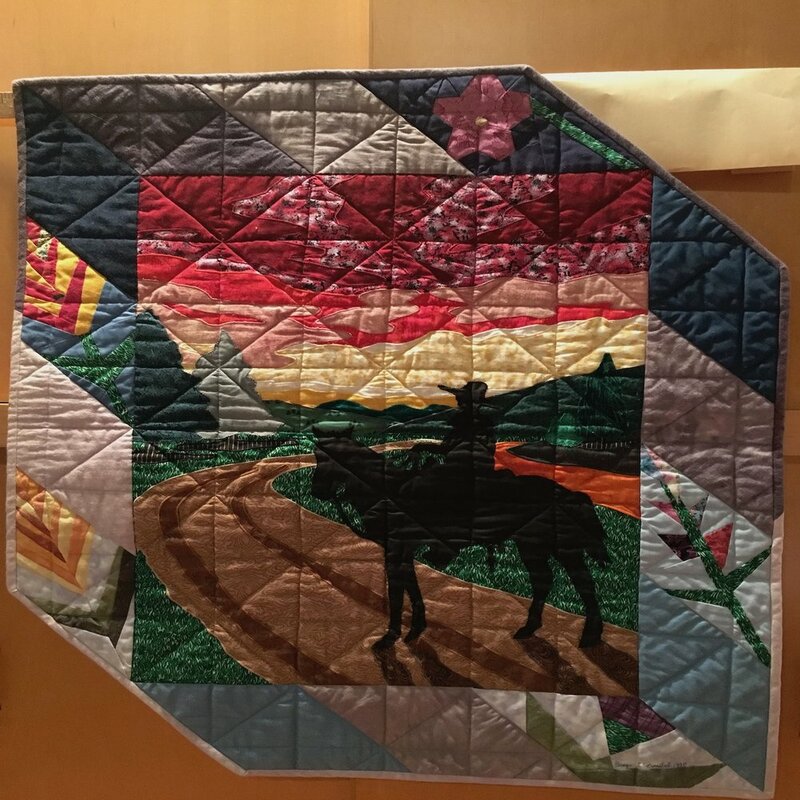 From the Spinning Spools continuity program from Oxmoor House this quilt features many of the blocks given out month by month. Segments of flying geese patchwork tie it all together in these bright cotton fabrics. Machine quilted on my BERNINA. A face off between two parrots as they sit on a branch. A larger picture can be sent upon request. A colorful array of coffee pots, all with different handles, cover this cotton quilt with more coffee pots in the printed sashing border. From pages 28-29 of Patchwork Potpourri. 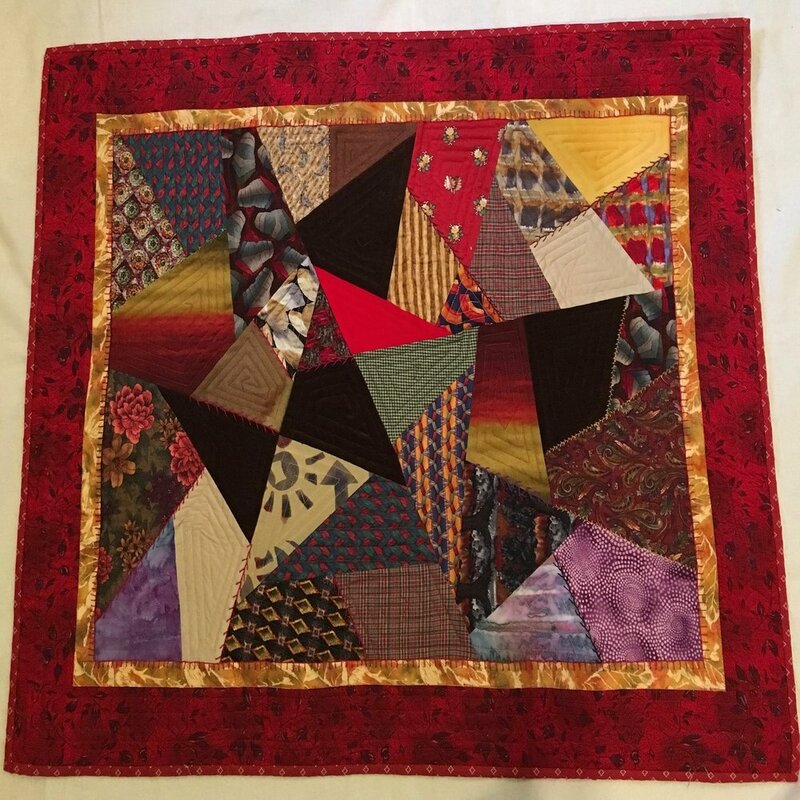 A special, unique coat featuring panels of the updated Bow Tie block shown on pages 99-105 of Patchwork Potpourri book. Original horse and rider design from Charlotte Warr Andersen with my wildflower paper pieced border. It is shown on page 66 of Patchwork Potpourri with instructions for only the wildflowers. From a class at the Nine Quarter Circle Ranch. A hand lap quilted throw in Christmas colors with the unique stitching together that creates a reversible quilt. A colorful heart appliqué quilt with a wavy lap quilted constructed backing. All machine sewn on my BERNINA. Inspired by an inlaid floor Genevieve Grundy translated this design to a southwestern type cotton quilt. Complete with matching top sheet and pillow case. Colorful seta color painting with horse shoes and western flora set on a gray background. Random machine quilting with extra beads added. A variation of the Interlock pattern from Bright Ideas book, page79. Made for class project at the Nine Quarter Circle Ranch, 2011. The longhorn steer border add to the appeal of the wavy border. 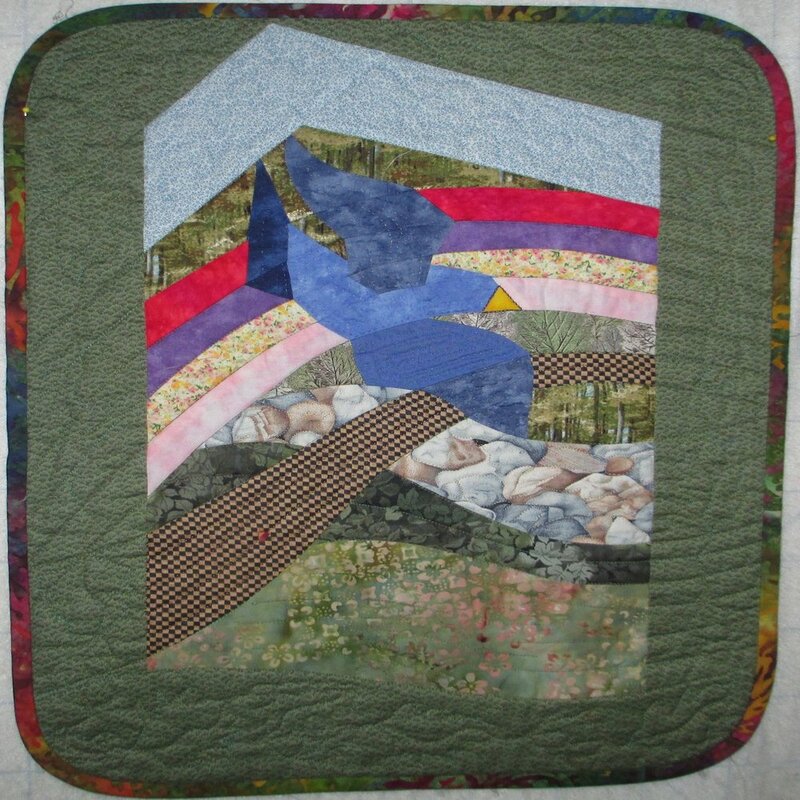 A blue bird flies over Mt Lincoln and a colorful rainbow, made in the curved patchwork method. Made for the Flat Rock Playhouse theater production in 2015 which they then cancelled. A more updated version of crazy patch in silks, velvet and cotton with machine embroidery. No, not Madonna! Head reflections of this professional quilter during the year 2000. The original presented in my new book just out, Scrap Happy Quilts. There is a Mt Eagle in every state! Clear, solid color cotton fabric stitched into a modern sunlight panorama. One line at a time machine quilting. Horizontal strip picture piecing captures the moon and stars above the cruise ship. 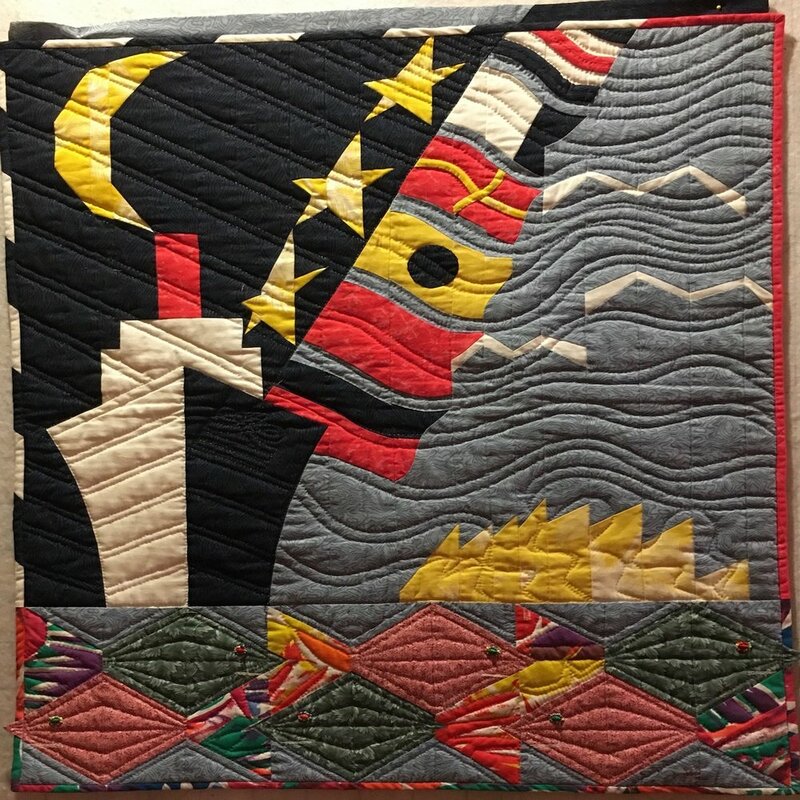 Made for one of my Quilt Cruises. Amazing how a simple triangle can bring sampler blocks to life as homes. Great teaching tool. The log cabin stable and Apaloosa horses decorate this wall hanging. 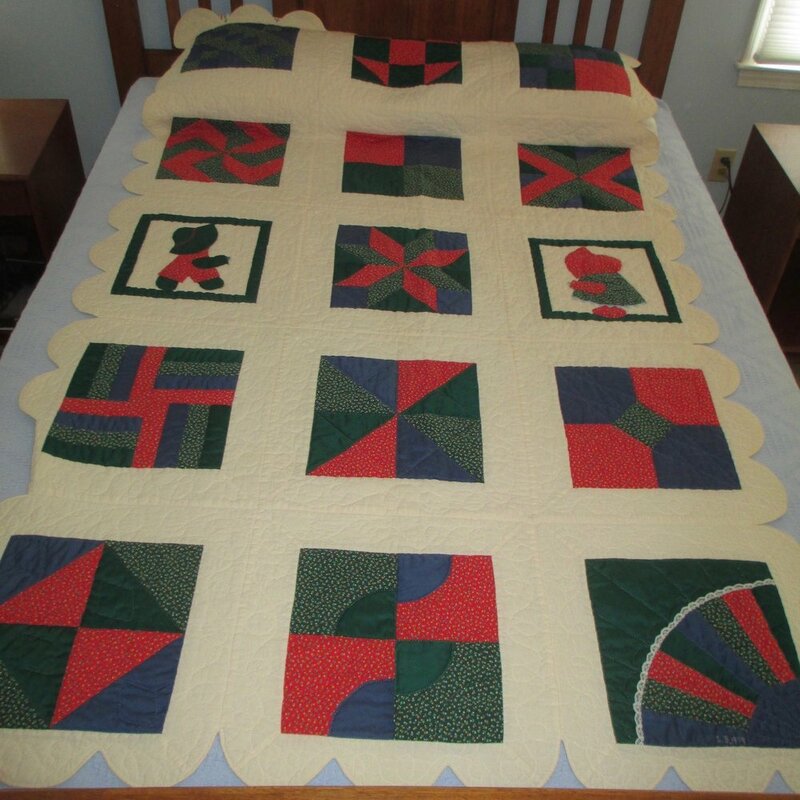 Made in 2010, machine pieced and quilted with hand appliqué green log end accents. This special wall hanging is headed to Washington DC for the Appalachian Regional Commission in June, 2019. Ice cycles and cardinals were the only thing outside for days. The hexagon snowflakes are embellished with buttons. 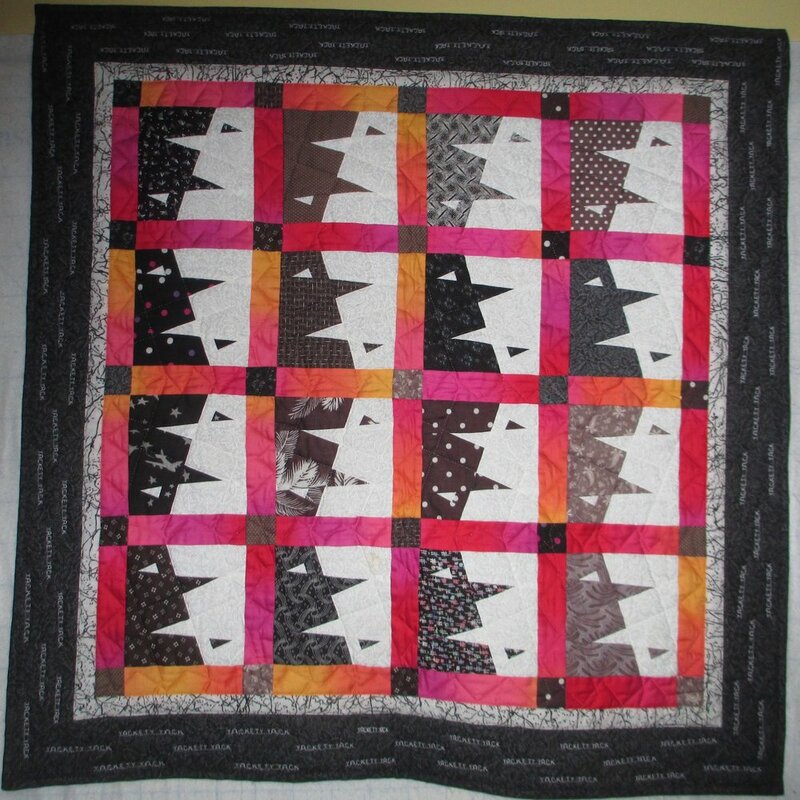 The Weathervane block adds extra appliqué after a quilt trip to Australia. Hand quilted finally in 2017. 60 degree diamonds are filled with Tea Pots and cups for a modern look. Great table topper. What was once muslin becomes woven bias strips of soft rainbow colored bars with Seta Color paints. No batting, just patchwork but great wall decor. Ferns and fauna from the backyard are featured on a green seta colored background. Novel leaf shaped corners highlight the border. The classic Dove in The Window block becomes Blue Bird in the window with blue cotton fabrics. A class project made in 2008 for Nine Quarter Circle Ranch. Machine quilted. The “9” block is free standing so could be replaced with another. Coral, mint and brown diamonds radiate outward in this LeMoyne star quilt with a colorful paisley background. Hand and machine quilted in 2016. 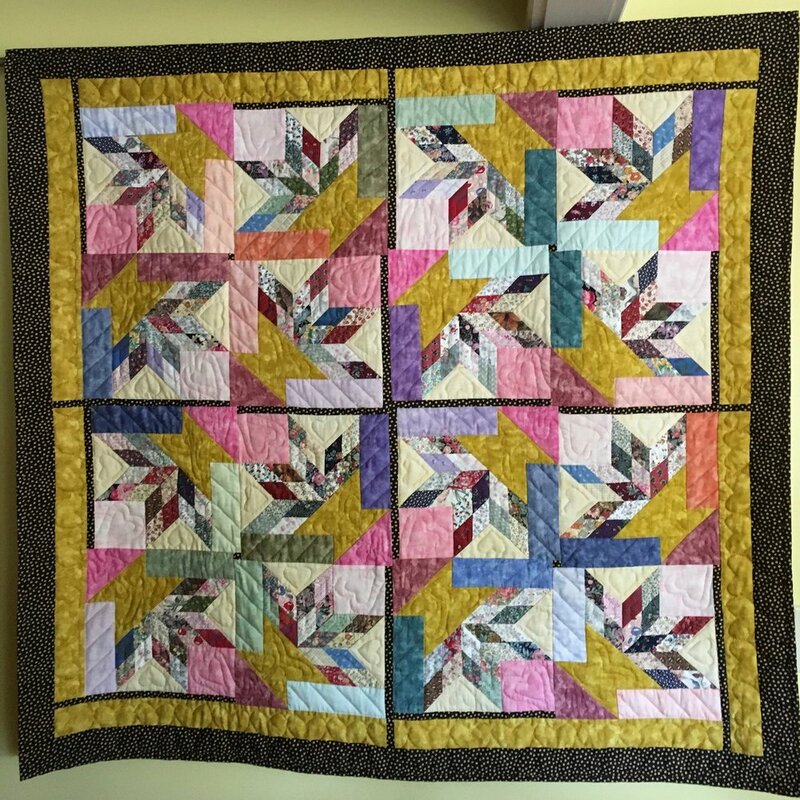 A unique lap quilted method using holiday cotton fabrics. Its Reversible! Featured in Lap Quilting Lives book, page 82. The cover quilt for the book, Lap Quilting Lives, made in shades of cotton aqua, blue and white wave border fabric. Featured on page 101. Featured on page 11 of Legacy book. Inspired by a collection of geometric tiles all in sync with hexagons our Granddaughter created a puzzle worthy of making in cotton fabric. Machine pieced and hand quilted (by Georgia) from page 108 of the Legacy book. The classic basket pattern is filled with scrap 45 degree diamonds. A special wall hanging. Featured in The Legacy book pages 113-124. 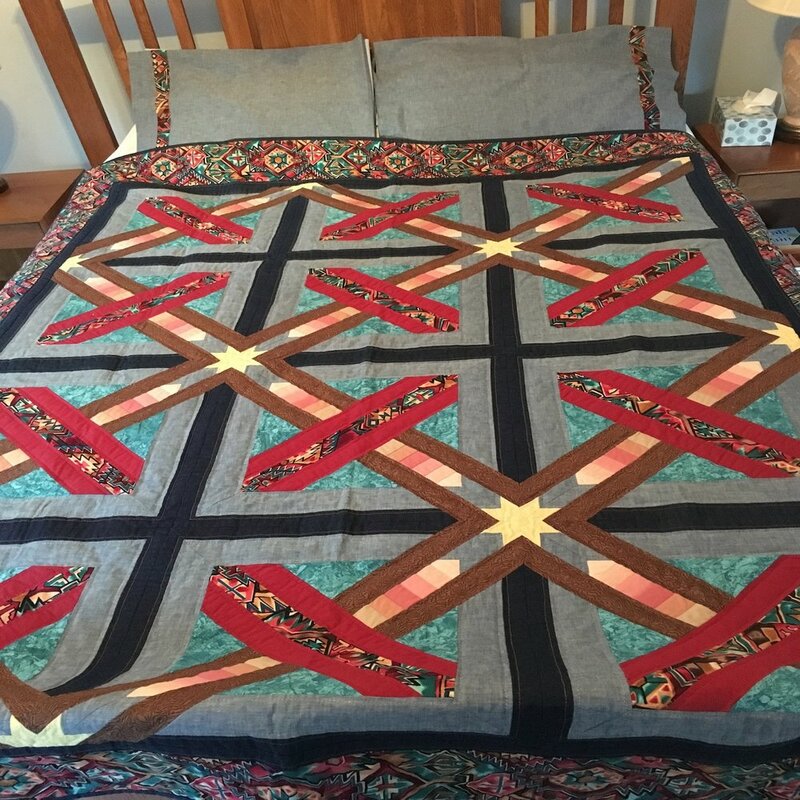 This cotton quilt is machine pieced and hand quilted by Georgia. The center block is the traditional Dusty Miller block with ever expanding bands from half square triangles to original motifs taken from hanging lamps to the border of marble step blocks. A one of a kind quilt responding to group quilting performed at retreats. It is machine stitched along with machine applique. This is an original design from Edward Larsen making it very collectable. All quilters “kick up their heels” for group get-aways. Page 92 of The Legacy bookk. An enormous collection of tote bags form a colorful spread, rather than a quilt. It is “weighty” due to the sturdy tote bags. From page 151 of The Legacy book. A bright wall hanging with cotton fabric, some seta color painted, featuring all 13 shows of the Lap Quilting PBS series. Each 6” block represents a state or county visited.